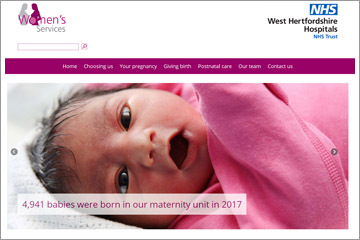 The platform contains information for women and their families about the maternity and neonatal services we provide across West Hertfordshire for families living in Hertfordshire, North London and neighbouring areas. Telephone numbers and contact names for members of the multidisciplinary team. Colette Mannion, head of midwifery and gynaecology, said:" I am delighted to launch this new website for maternity services which is the culmination of a significant amount of work from our maternity services staff. We are also proud of and grateful to the new mothers and their babies who were involved in the development of the website. I am confident that it will be an excellent resource for mothers and their families throughout their pregnancy journey." For For more information, please contact the communications team on: 01923 436280 or email: communications@whht.nhs.uk. Out of hours, please call 07900 228031.